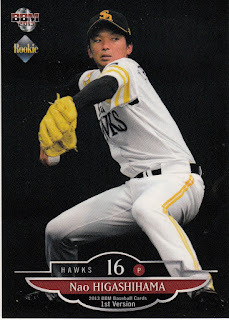 On Wednesday of last week, Takuya Furuya of the Marines took a no-hitter into the ninth against Orix before surrendering a hit with two outs. 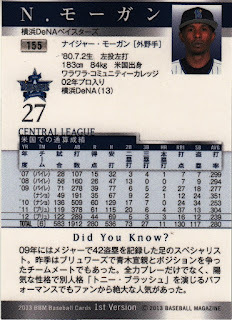 This was just about four weeks after he threw a no-hitter against the Baystars at the ni-gun level. 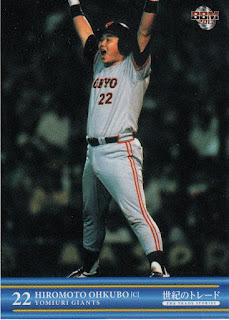 Had he completed the no-hitter against the Buffaloes I suspect he would have been the first pitcher to ever throw a no-hitter in the minors and a no-hitter in the majors in the same season. 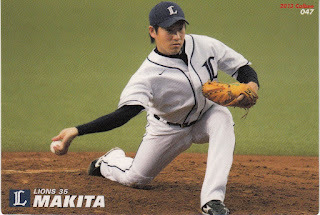 But since he didn't, this week I'm going to showcase the pitcher who did throw a no-hitter last week. 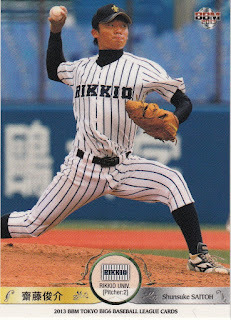 On Friday, Daisuke Yamai of the Dragons no-hit the Baystars at the ichi-gun level. 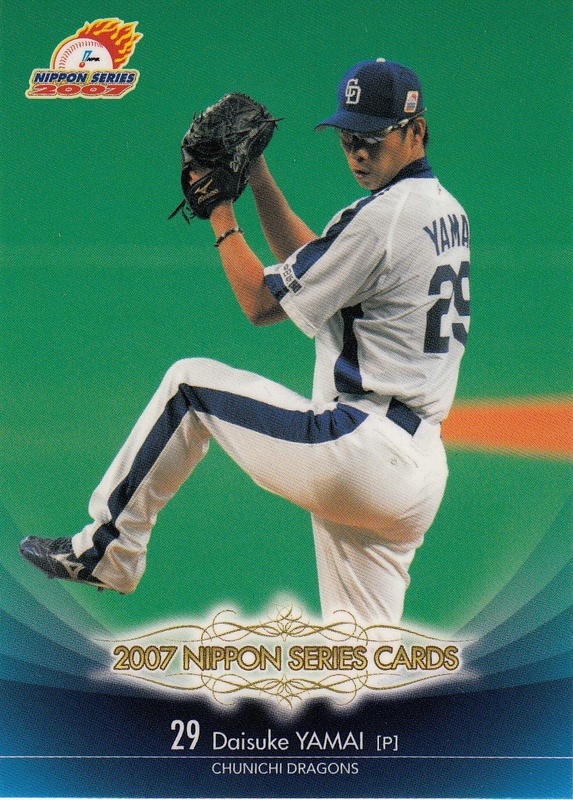 Yamai of course famously had a perfect game going through eight innings in a Nippon Series game in 2007 against the Fighters when he was lifted for closer Hitoki Iwase in the ninth inning. Iwase got three quick outs to clinch the perfect game (and not incidentally the Dragon's first Nippon Series champsionship since 1954). 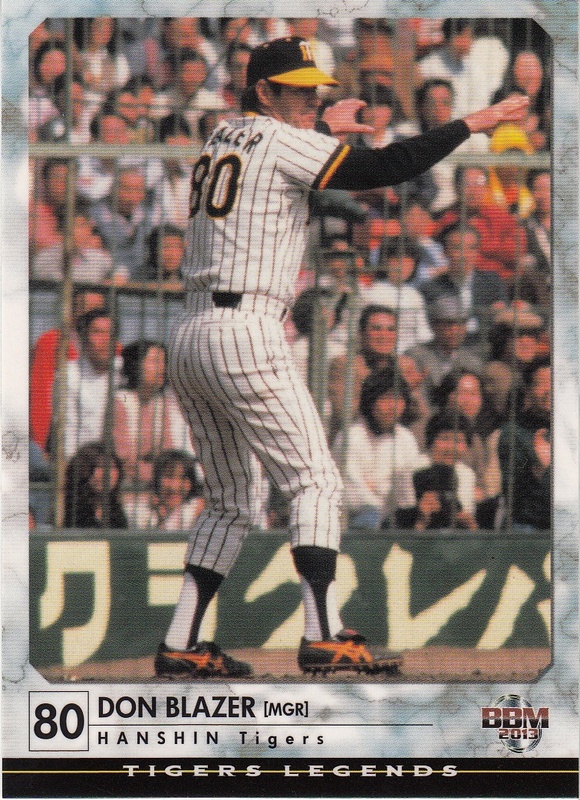 This time around since the score was 9-0 rather than 1-0 and 53 years of frustration in Nagoya was not riding on the game, Yamai was allowed to complete the no-hitter. 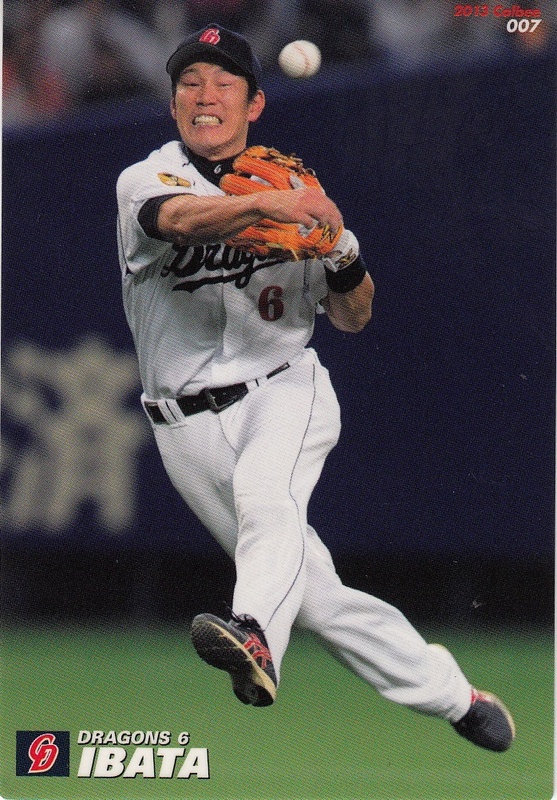 And just so you know - I know this is from Yamai's perfect game because that's the only game that he appeared in during the 2007 Series. 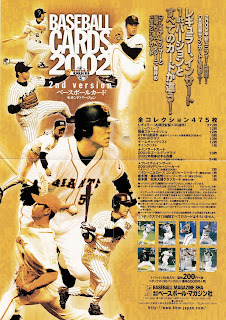 Earlier this year, BBM put out a Giants Legend set that highlighted the players who played under Shigeo Nagashima's reign as manager. 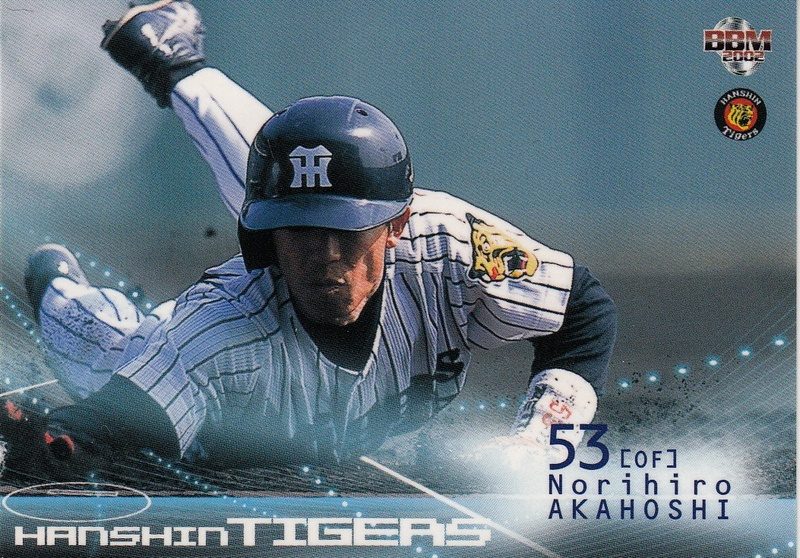 They've now followed that up with a similar set for the Tigers. 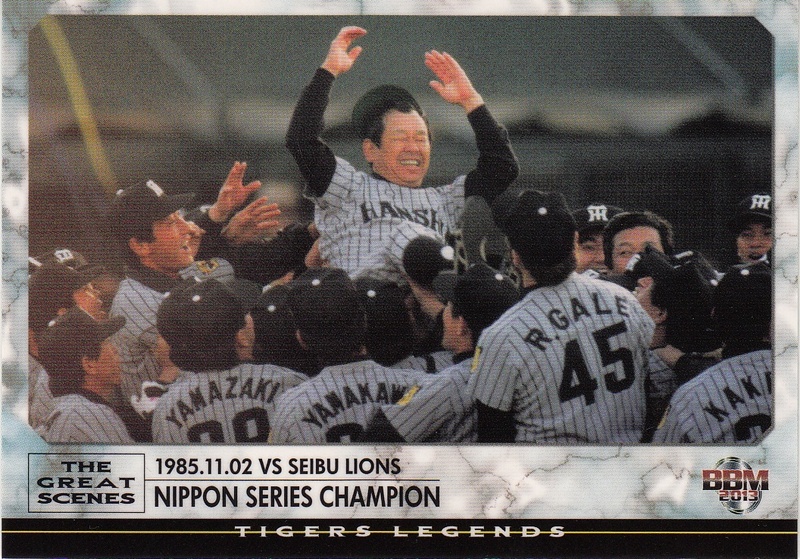 Now obviously Nagashima never managed the Tigers so this set's theme is Tigers players from the 1980's, especially the 1985 Nippon Series championship team. 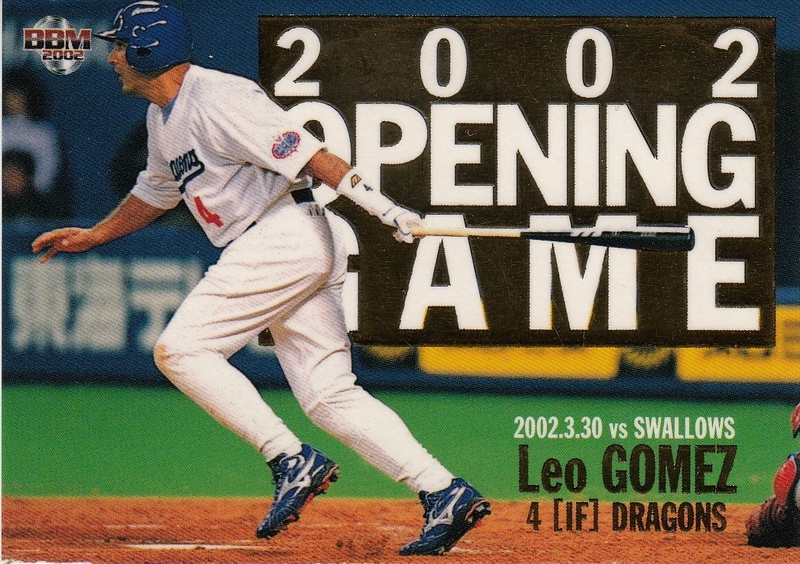 Like the earlier set for the Giants, this set is a pack based set featuring 99 cards in the base set. The design of the cards is the same as the cards in the Giants set, only with a grey-ish, blue-ish background rather than the lighter colored background on the Giants cards. 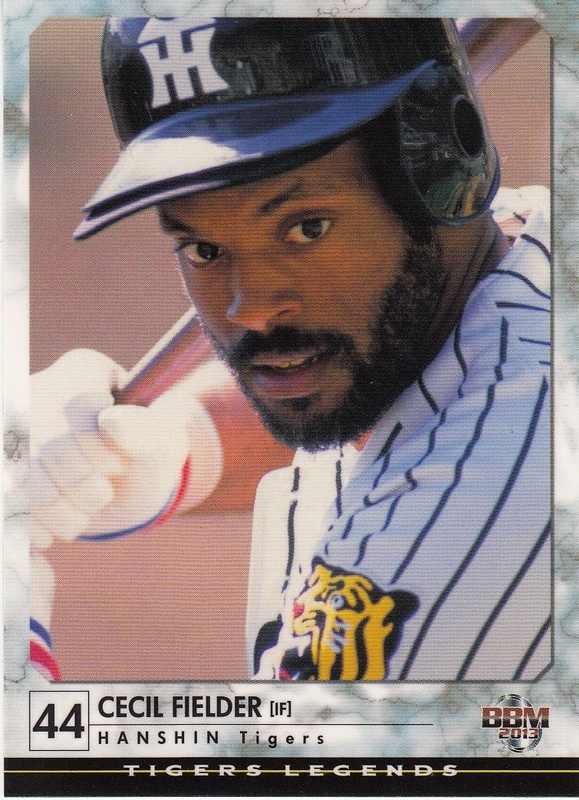 The first 88 cards in the set are for Tigers players and managers from the 1980's. 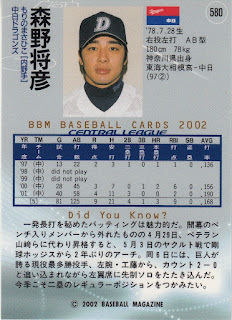 The obvious players are here - Masayuki Kakefu, Randy Bass, Akinobu Mayumi, Akinobu Okada and Taira Fujita for example. Almost everyone who played on Hanshin's sole championship team in 1985 is in the set - as far as I can tell, only Koichi Hattori, Shinji Kawahara and Eijiyu Tsukiyama did not make the set and none of them actually played much for the 1985 team (or any other Tiger team). Can't think of anyone off hand who's missing - maybe Colonel Sanders? I was a little surprised that there were a bunch of black and white photos - maybe BBM just likes including them for variety. 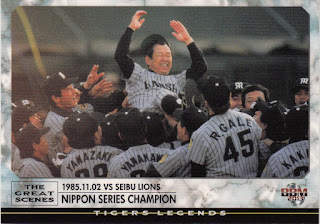 There's a two card subset showing the 1985 championship celebrations for both the Central League pennant and the Nippon Series. The subset doubles as the checklists for the set as well. 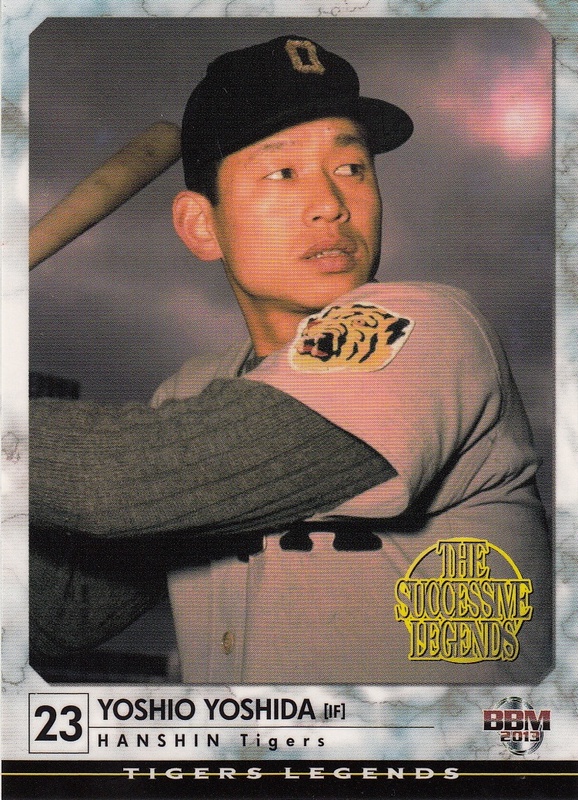 The last nine cards in the set is a subset called "The Successive Legends". 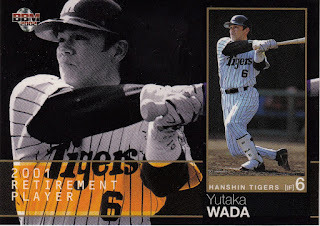 BBM selected a significant Tiger for each era in their history. It starts with Tadashi (Bozo) Wakabayashi, followed by Masaru Kageura, Fumio Fujimura, Masaaki Koyama, Minoru Murayama, Yoshio Yoshida, Koichi Tabuchi, Tsuyoshi Shinjo and Tomoaki Kanemoto. 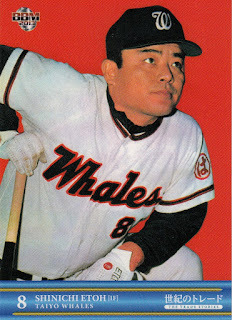 Yoshida is the only one who also appears in the "regular" part of the set as he was manager of the Tigers in the mid 1980's. 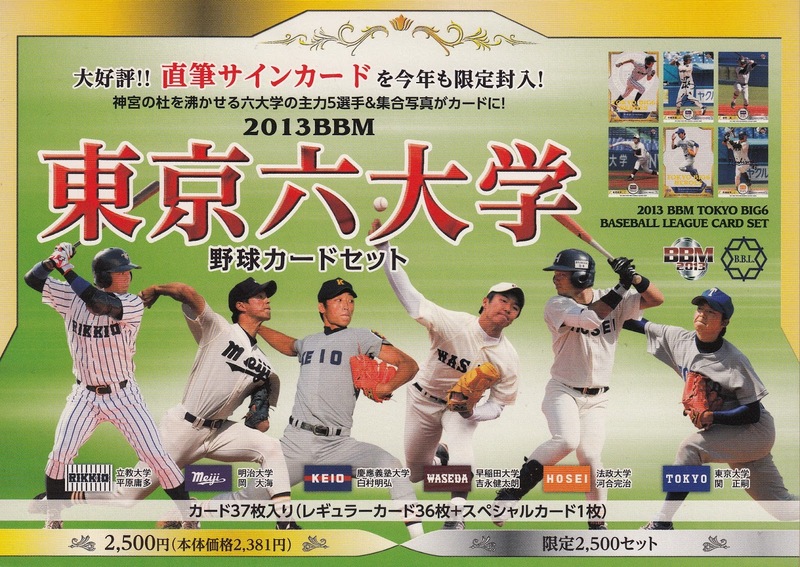 I got this year's edition of the BBM Tokyo Big Six set a few weeks back. As has become the standard the last few years, this box set contains 37 cards - 36 base cards plus one special card. 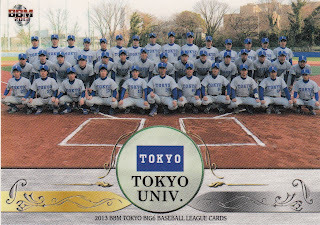 The 36 base cards break down to six cards per team - five player and one team card. 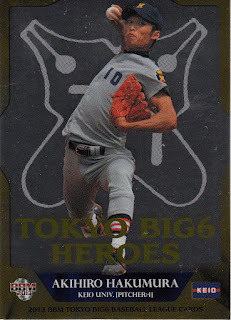 The special card is either a "Tokyo Big Six Heroes" insert card or an autographed version of one of the player cards. As usual, the cards look pretty good - an attractive design and very good photography. I don't know enough about the players in the Tokyo Big Six league to know if the player selection is decent, although I did notice that Yuhei Takanashi, the Waseda pitcher who threw a perfect game back in April, was not included in the set (even though he was in last year's). That means that there's 704 sets that don't have autographed cards. 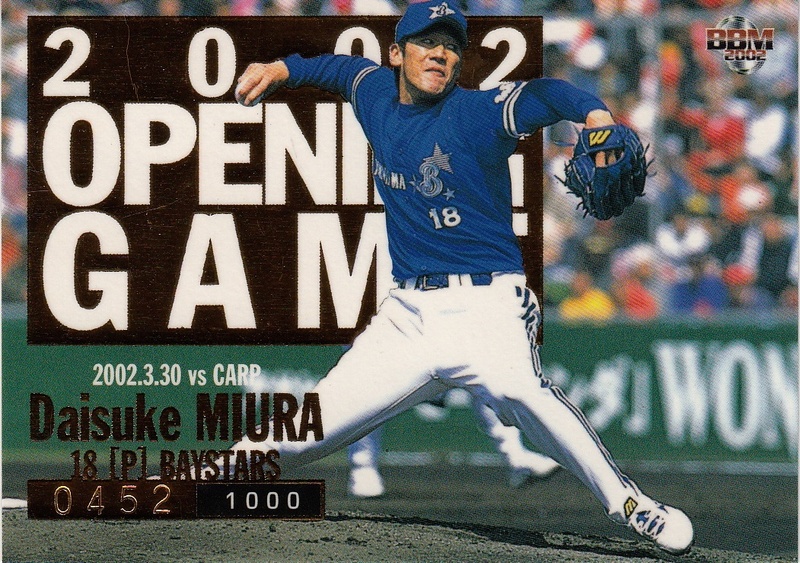 Since there's six insert cards (one for each team) that means that there's 117 or 118 of each insert card. You can see several of the inserts at Jambalaya. Thought I'd do my writeup of this year's 1st Version set in the same style I've been doing the "regular set" posts. 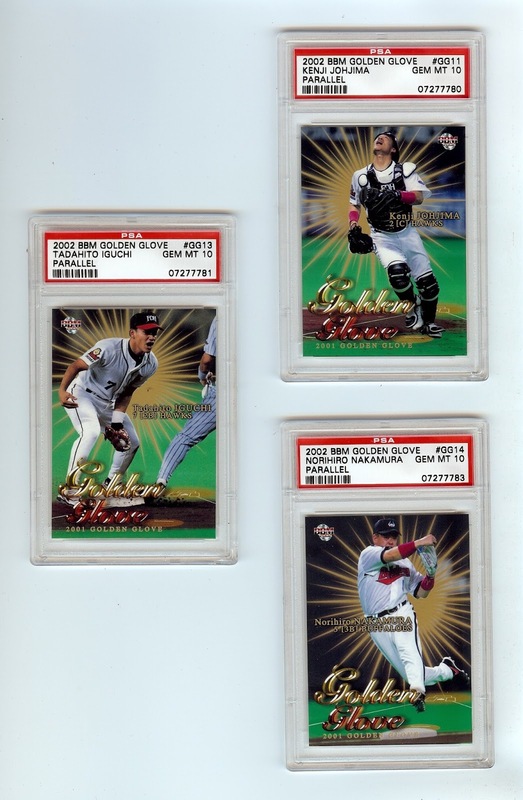 Parallels: silver signature (9 per team), gold and hologram signature (numbered), numbered parallels for rookie cards, Best 9, Golden Glove, Cross Wind, New Principal and Diamond Rookie cards. 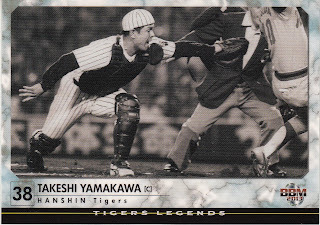 I was going to start writing about this set by complaining - the set has the same subsets as last year, there's too few cards in the set, the cross set subset thing is getting old, the mascots on the team checklist cards is REALLY getting old - but one thing keeps me from doing it: the cards are freaking gorgeous. BBM has returned to a full bleed photo on the regular player cards for the first time since 2009 and it looks really good. BBM also has the usual fine photography (and this year Keiichi Hirano is not shown doing a head first slide) and the combination of great photos and a good design really shines. I've got the insert cards and parallel versions listed in the summary but I don't know much about them as I don't have any Jambalaya has pages up for the silver signature parallels, the inserts (except for the Lightning cards) and the memorabilia and numbered parallel cards. 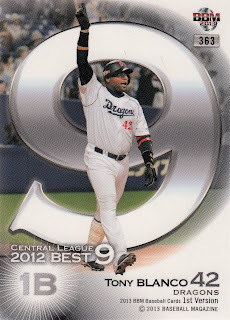 If I'm reading this right, the numbered parallel versions of the Best 9 and Golden Glove cards are plastic. I'll mention that there's another parallel edition out there that I didn't list above. The guy I bought my set from included a small set of six cards labelled "Card Shop Limited Edition". 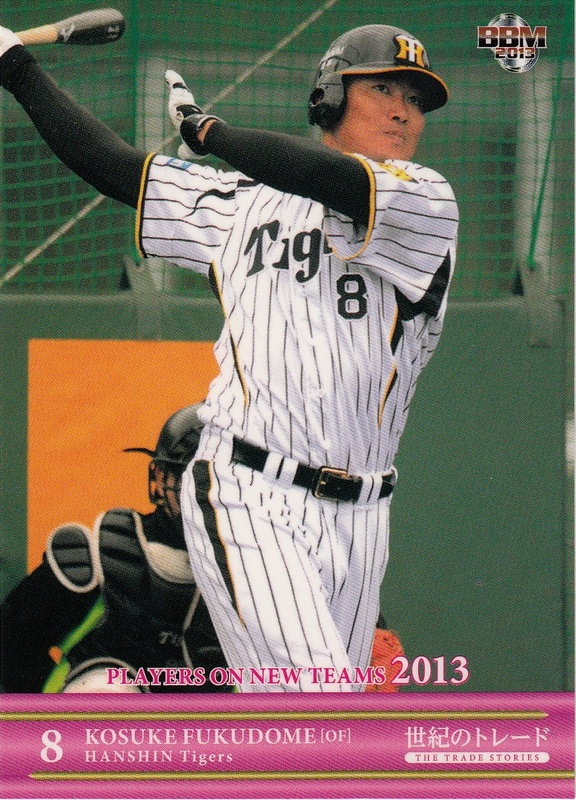 The cards are all double sided so there are 12 players included in the set (one from each team of course). Because they are double sided, they are unnumbered. 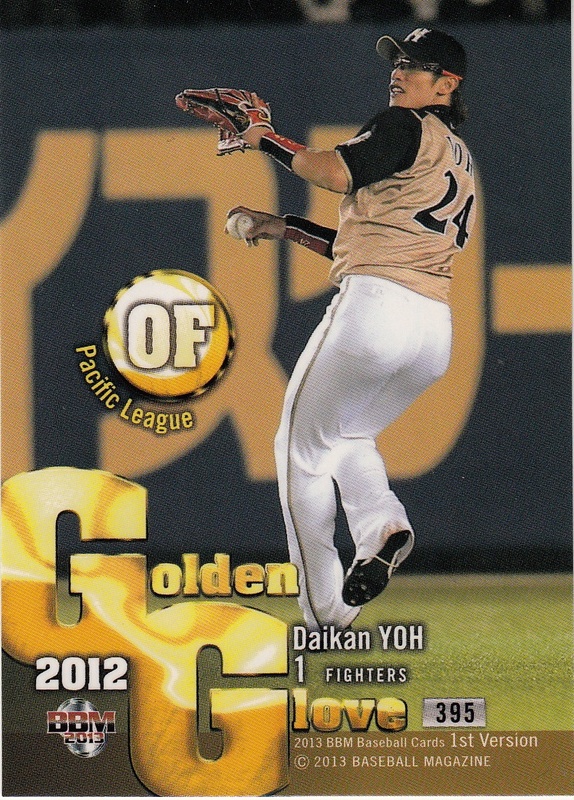 The cards differ from the regular version by having a gold tinted background (and the background of the bar with the player's name is also gold). As I said above, the cross set subset thing is getting old. BBM completed the "elements" theme that started in 2010 with the Cross Stream (water) set, followed by the Cross Blast (earth) set in 2011 and the Cross Fire set in 2012 with the Cross Wind set. Like last year's set, Cross Wind will have 36 cards in the 1st Version set, 36 cards in the 2nd Version set and the final 36 cards in Genesis (or whatever the high end set ends up being called this year) for a total of 108 cards (9 per team). 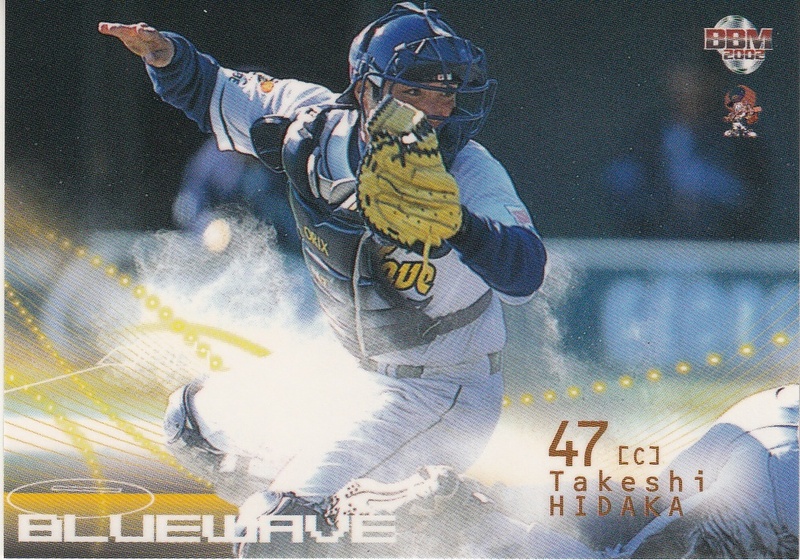 Like every other year, the front of each card features the image of a player superimposed on the same background on every card - this year the background represents wind with clouds. The back of each card shows the original full picture that the player's image was taken from. The cards are numbered separately from the rest of the set - the first three cards are CW001-CW003, the next three are CW010-CW012, the next three are CW019-CW021, etc. Also as I said above, the team mascot thing is getting really old too. 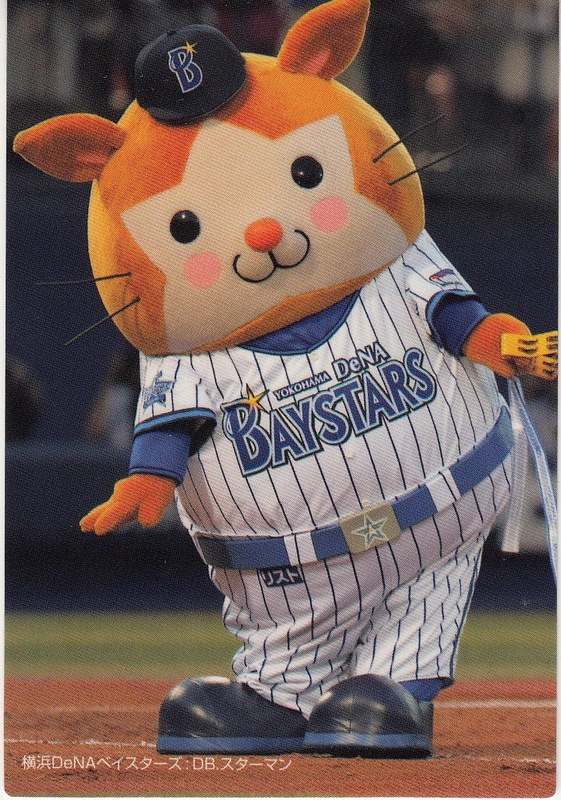 This makes the fourth time in the last five years that BBM has used mascots on the team cards - and I'm pretty sure they didn't do it last year simply because the Baystars hadn't revealed their new one yet. 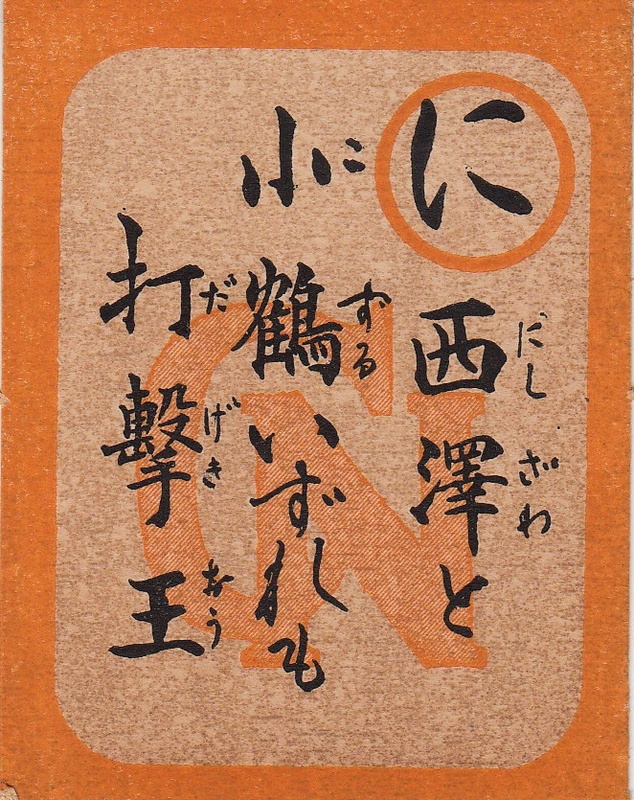 The card I got is from a set from 1949 that Engel refers to as "JK2 - 1949 Karuta (Team Emblem)". 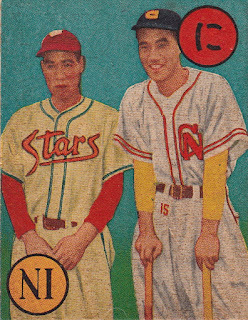 It shows Makoto Kozuru of the Daiei Stars and Michio Nishizawa of the Chunichi Dragons. This particular pair of cards is matched by the hiragana character "ni" which is actually shown in English on the picture card. Not all Karuta sets show the hiragana character in English. 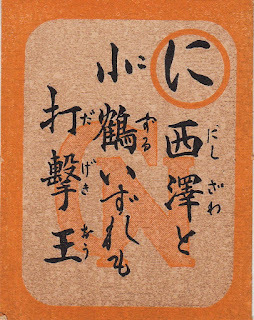 The heyday of the Karuta sets appears to have been between 1948 and 1958. 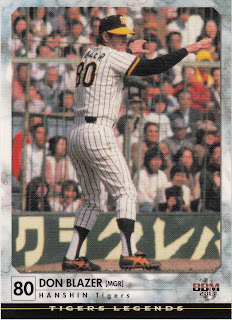 Engel lists 23 sets from this period, along with a couple from the 1970's. Topps Series Two was released last week. 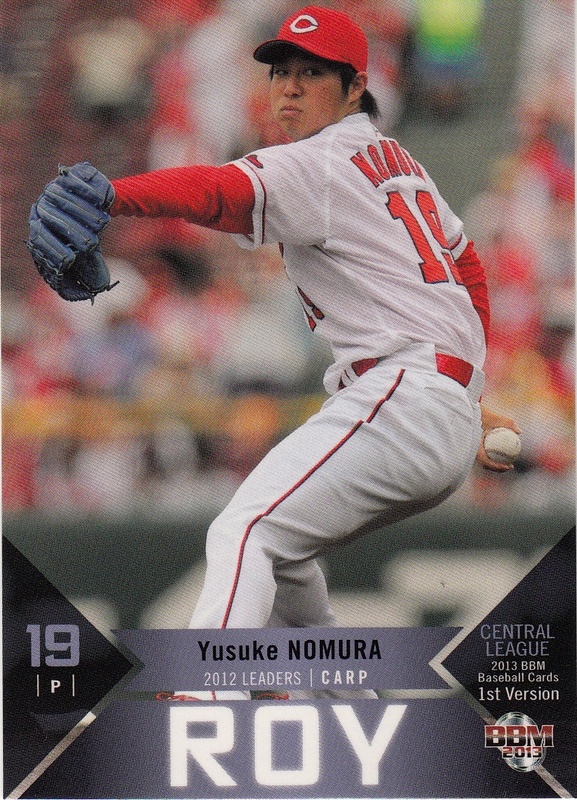 It includes the first World Baseball Classic set for 2013 - a 15 card insert set. I picked one up on eBay the other day and I just got it in the mail. I was kind of worried about a set that small and my fears were confirmed - no Japanese players in the set. In fact, none of the eight teams that played in the Far East for the first two rounds (Japan, China, Taipei, Cuba, Brazil, Australia, Korea or the Netherlands) are represented in the set. 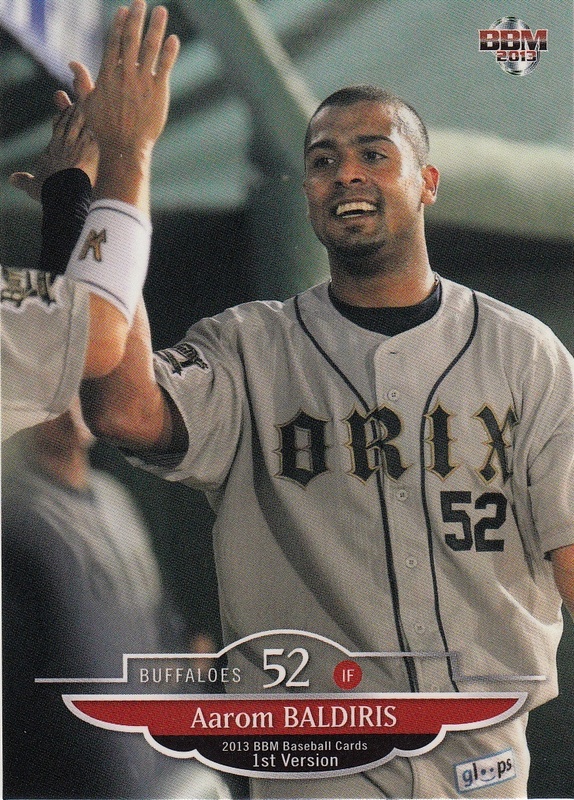 Only seven team made the cut - Canada (Justin Morneau and Joey Votto), Dominican Republic (Robinson Cano, Hanley Ramirez and Jose Reyes), Italy (Anthony Rizzo), Mexico (Adrian Gonzalez), Puerto Rico (Carlos Beltran), USA (Ryan Braun, Joe Mauer, Giancarlo Stanton and David Wright) and Venezuela (Miguel Cabrera, Carlos Gonzalez and Pablo Sandoval). (In case you're wondering, Spain is the only team that played in the first two rounds in the Western Hemisphere that isn't represented in the set.) I guess Topps pretty much decided to go with established major leaguers in the set. 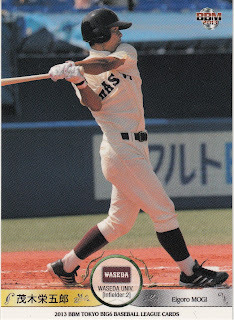 I know the preliminary checklist for Topps' other World Baseball Classic set (Topps Tribute WBC Edition) includes 15 Japanese players. That set will be out this week. It remains to be seen if the base set will be reasonably priced - the inclusion of jersey and autograph cards and all sorts of parallel issues is driving the price of the unopened packs and boxes ridiculously high. 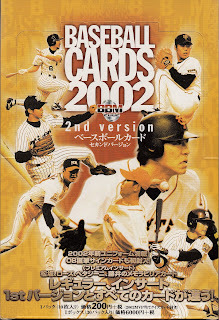 I'm holding out hope that Konami's going to do a set similar to their 2009 set but I haven't seen anything about it yet. If Manny had come to Japan, I was trying to figure out what card set he might appear in. 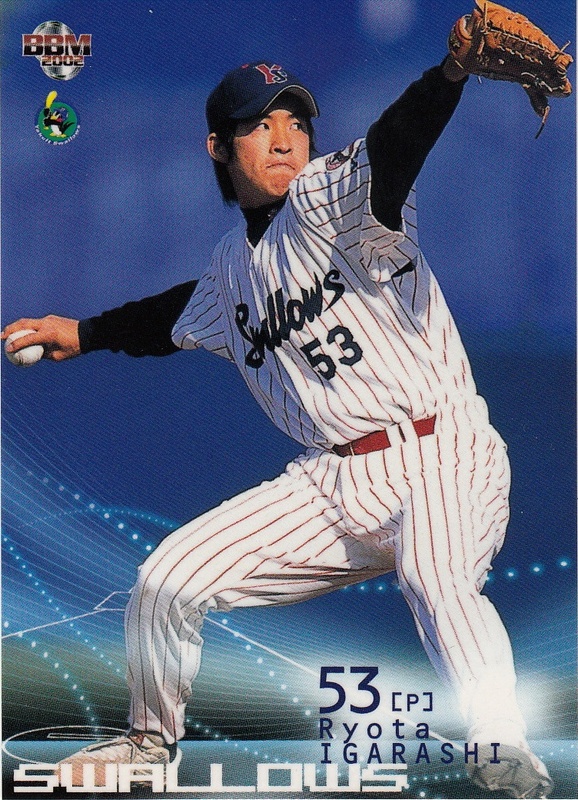 I think it would probably be too late for him to be in BBM's 2nd Version (early August release) but he could probably have made it into Calbee's Series Three set (usually out in mid September). If the Marines made it to the Nippon Series, he'd be in that set also. I kind of wondered if BBM would find an excuse to do a late season box set for the Marines as well. 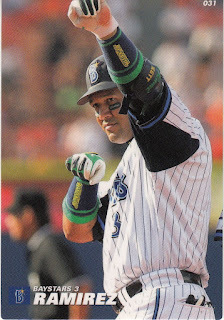 If the Marines do pull off the rumored trade for Alex Ramirez, I'd expect the same card possibilities. I did get an email from the guy I bought the 2012 Taiwan set from saying that the 2013 CPBL set including Ramirez would be out "in months". I just don't know how many. I'm starting to wonder if Calbee has decided to mail it in on the flagship set the way BBM has the last couple years. (And since Calbee only has a flagship set, that's really getting lazy.) 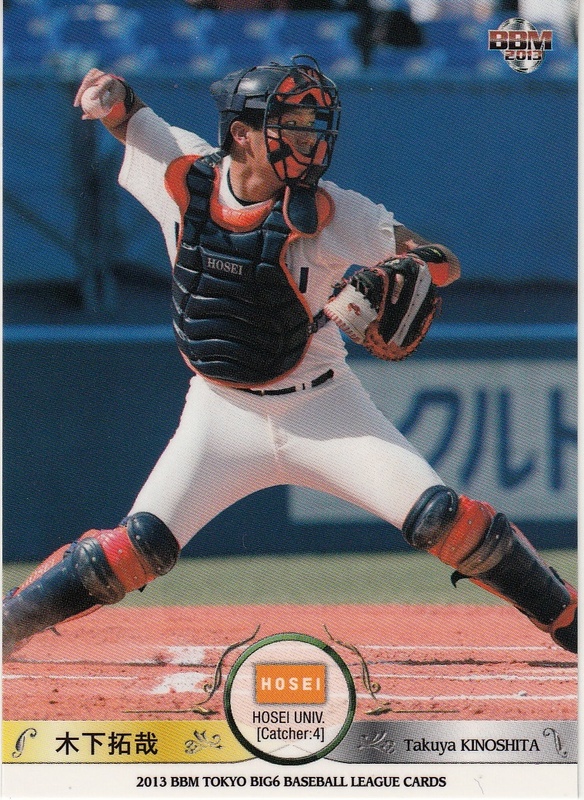 Don't get me wrong - Series One contains the usual attractive photos in Calbee's standard design. It's just I feel like they did the minimum required to put this set out. Let me get to the details about the set. 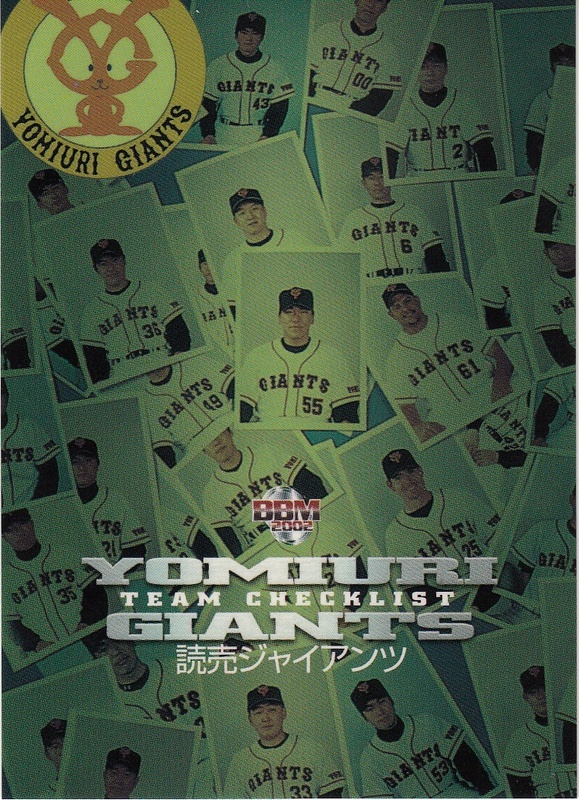 It contains 100 cards, 72 "regular" player cards, 24 "Titleholder" cards and four checklist cards. So that's my first complaint - in previous years, Calbee had at least two subsets to go with the regular cards and the checklist cards. This year, just the one. It's the player selection that I find lazy with this set. None of the players included changed teams this past winter and none of the players included are rookies. So it's pretty obvious that all the pictures were taken last season. Not a big deal as Calbee has two more Series to include these players but it's just another example of the lack of effort behind the set. BBM included three guys in their Leader subset that Calbee didn't include in Title Holders - Tatsunori Hara (Shoriki Award), Yoshio Itoi (OBP), and Kan Ohtake (Comeback Award). I have a gripe about Itoi being left out. 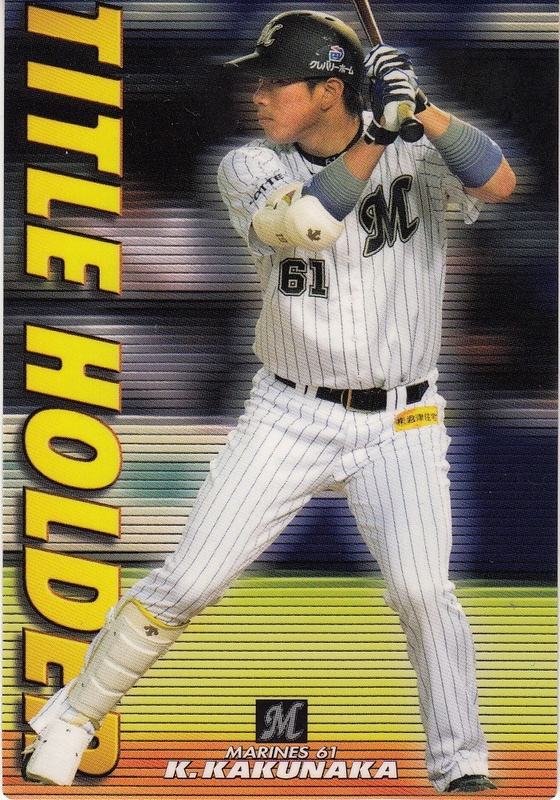 While BBM always depict the players in their Leader cards in the previous year's uniform, Calbee always depicts the Titleholder players in the current year's uniform. 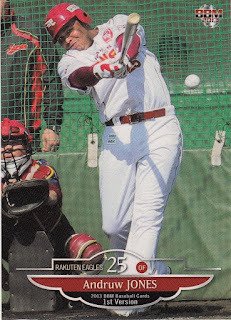 So last year, BBM showed DJ Houlton as a Hawk while Calbee showed him as a Giant. 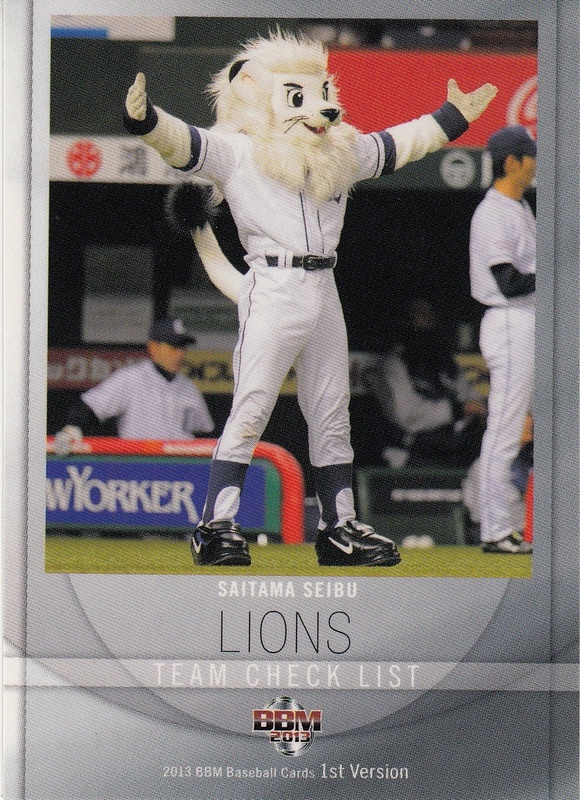 Apparently this year Calbee couldn't get a picture of Itoi as a Buffalo, so they left him out. 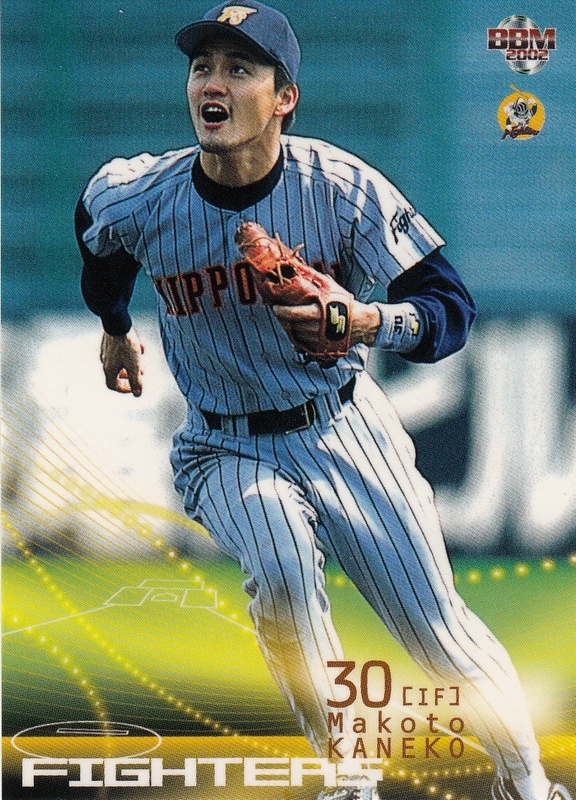 Now I applaud Calbee's decision not to airbrush or photoshop a Buffaloes uniform on Itoi like Topps would have, but maybe they could have still included him in a Fighters uniform. Calbee's actually selling some sort of "special" box set featuring the Best 9 players from last season, but they left out the four guys who changed teams in the off season. Two of them were heading for the States (Nakajima and Tanaka) so I can understand their omission, But the other two were Itoi nad Tony Blanco. 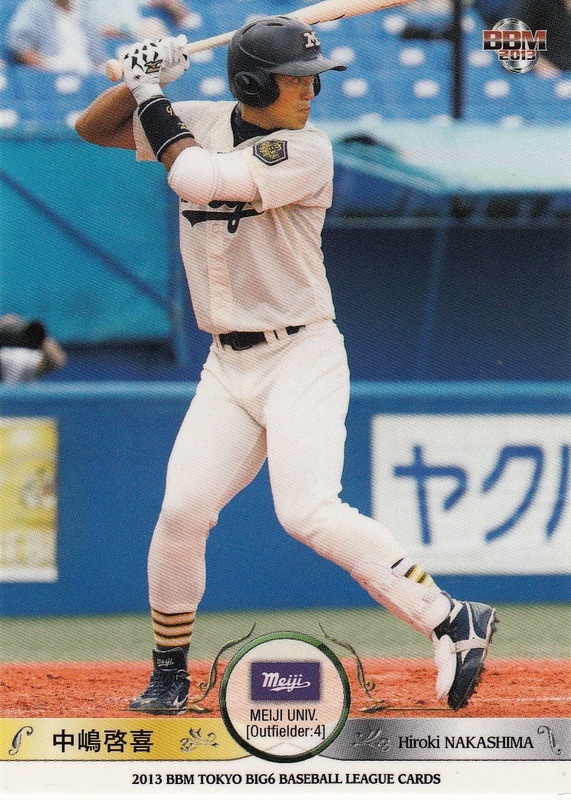 Maybe the fact that Itoi was playing for the WBC team is an excuse for not getting a picture of him in a Buffaloes uniform (not that it stopped BBM for "The Trade Stories" set) but there's really no excuse for not getting Blanco. My final complaint about the set is the checklist cards. 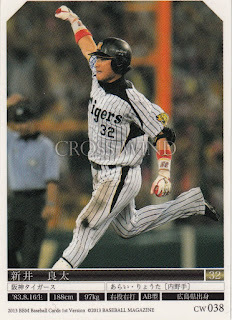 In past years, the checklist cards have featured exciting action shots commemorating great plays and significant events. This year, they are featuring the team mascots. It's bad enough that BBM has seen fit to do the mascots on the team checklists in the 1st Version set something like four of the past five years. 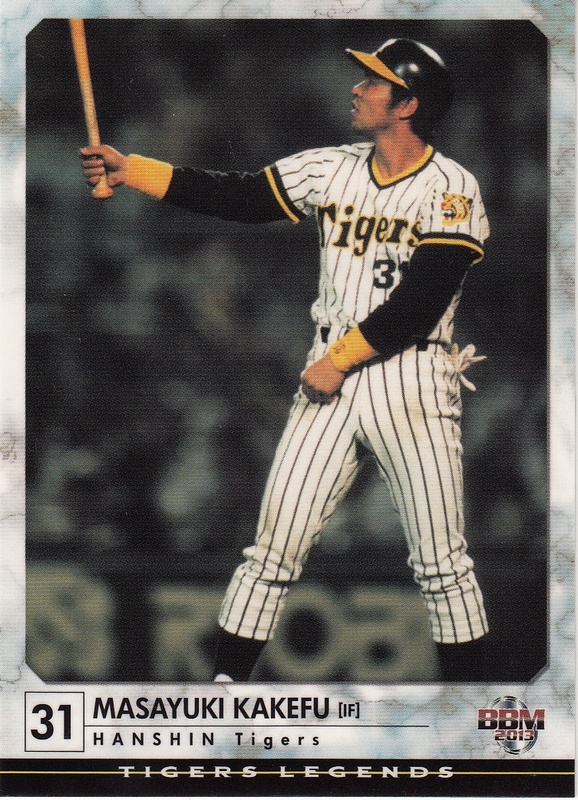 There's really no reason for Calbee to do it too, but they did. I guess someone at Calbee couldn't resist the symmetry of their being 12 teams in NPB and 12 checklist cards (four in each of the three Series). Funny thing happened today - my daughter made me a Father's Day card using some images she found online. 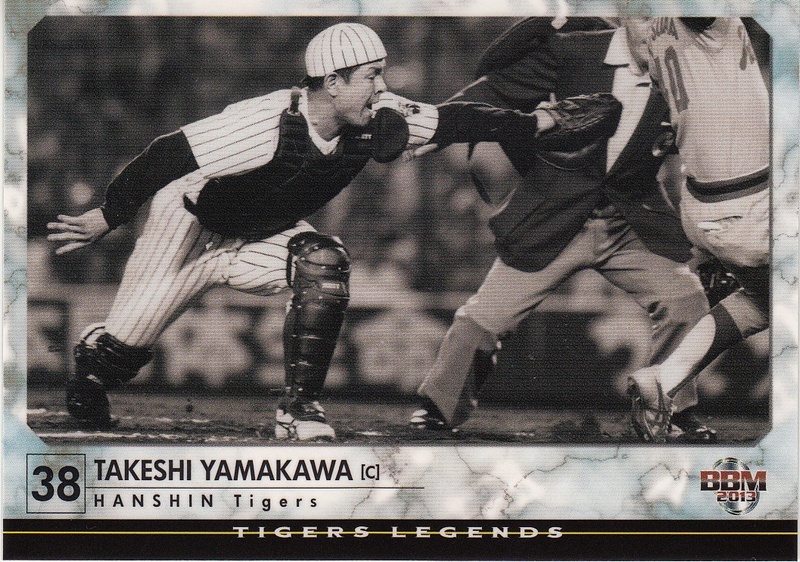 Being 14 and contrary, she decided she would feature images of the mascots of two of my least favorite baseball teams - the New York Yankees and the Yomiuri Giants. So once I got over my amazement that she actually found a picture of Dandy, I realized that the picture she had found of Giabbit looked awfully familiar. She said she found it by doing a Google search on "japanese baseball cards giants mascot". When I did the same search, the image of the card lead me to this page which showed the card and credited me for it. Did a little searching and sure enough, I had posted the card four years ago. It is a small world after all. 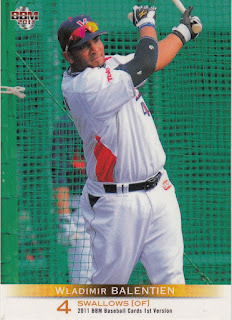 Wladimir Balentien of the Swallows did something pretty cool last week - he homered in four straight at bats spread out over three games. 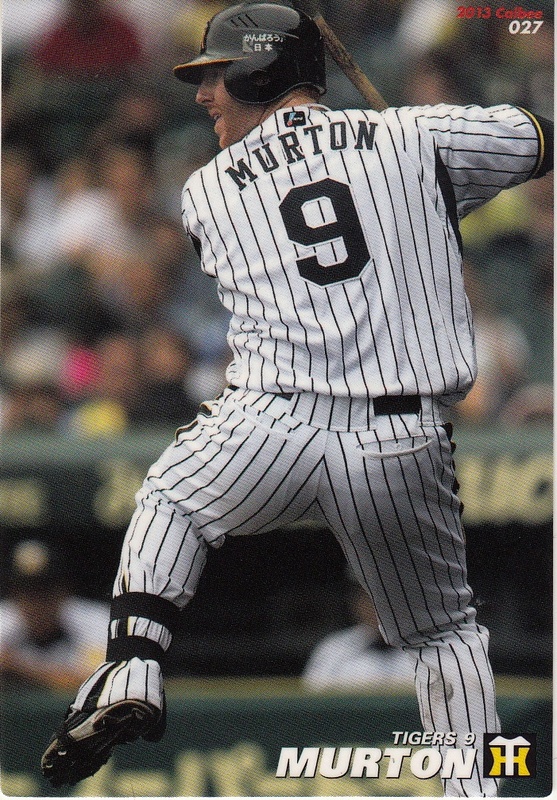 He hit his 17th of the season in the ninth inning of an 8-4 loss to the Fighters on the 8th, hit numbers 18 and 19 the next day in a 10-4 loss to the Fighters (mixed in with two walks) and then number 20 in his first at bat in Wednesday's 7-3 defeat by the Hawks. 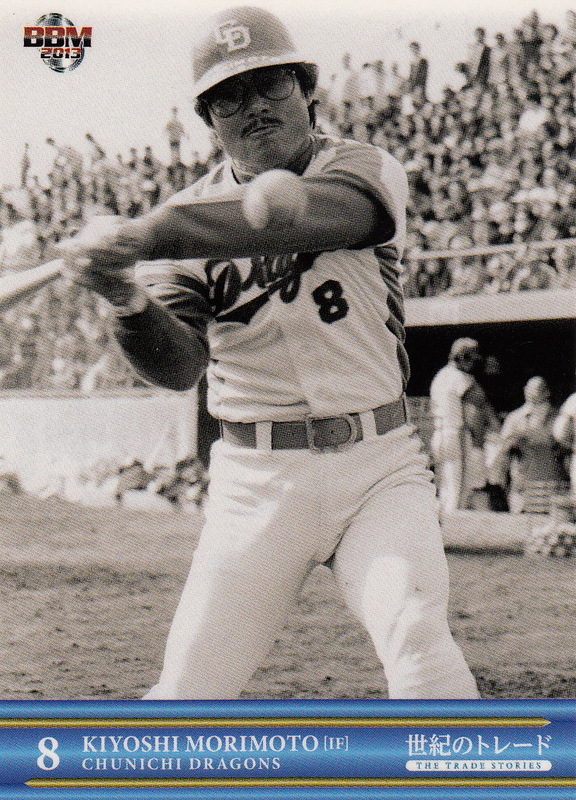 He hit his 21st homer today, putting him only two back of Tony Blanco for the lead despite having played 11 fewer games. Christmas came six months early for me yesterday as I got six sets from Japan in the mail. So I'll be spending a little time getting caught up on some sets released in the last three months. First up is a set released in mid March called The Trade Stories. This is a 90 card set that highlights great trades in NBP history. There are 72 cards of OB players who were traded in what I guess were significant trades in history and 18 cards for current players who are with new teams for 2013. 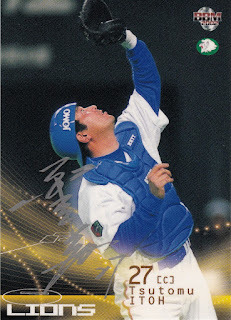 The 72 cards for OB players each feature one player each. 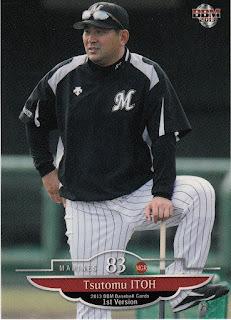 It's not obvious looking at the cards what the trade was that the player was involved in and who they were traded for. It looks like the cards are grouped together by trade - for example, card #1 is Masaaki Koyama and card #2 is Kazuhiro Yamauchi. Those two were traded for each other in the 1963-64 off season (Koyama from the Tigers to the Orions and Yamauchi obviously the other way). It's not clear though that everyone in the set has someone else in the set that they were traded for. 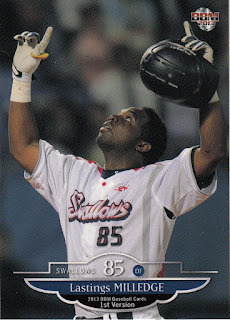 So while I find the set interesting, it would be more interesting if there was some obvious indication of who was traded for who on the cards. The set does include some reasonably big names - Shinichi Etoh, Katsuo Ohsugi, Isao Harimoto, Koji Akiyama, Koichi Tabuchi, and Masahiro Doi are all in the set. 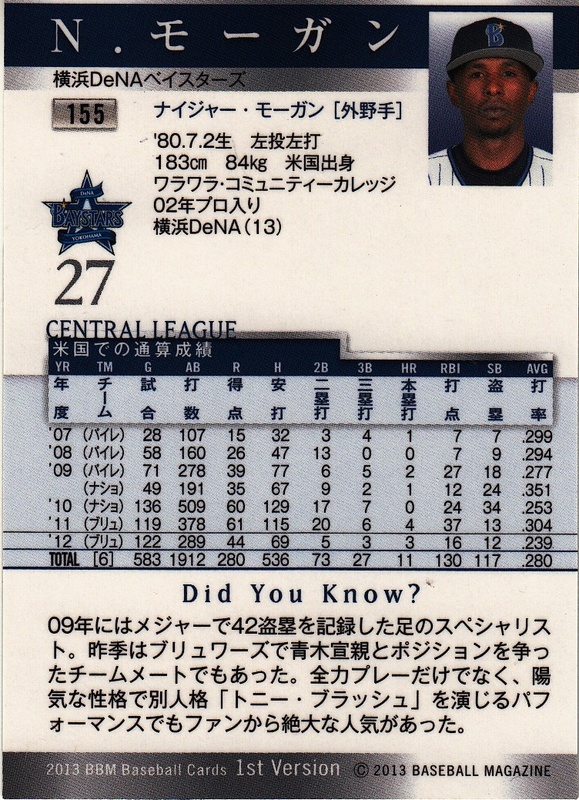 I was surprised and disappointed that Hiromitsu Ochiai did not make the set - he was traded from Lotte to Chunichi following the 1986 season for four players. 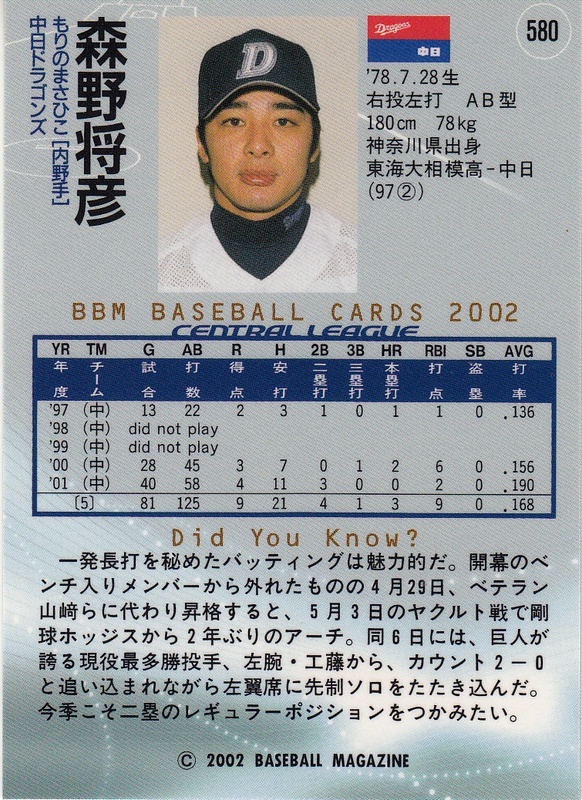 I also noticed that despite the fact that the trade that sent Koji Akiyama to the Hawks from the Lions for Makoto Sasaki involved six players in total, only Akiyama and Sasaki made the set. As is typical for an OB set from BBM, the set is heavy with players from the 1970's to 1990's. 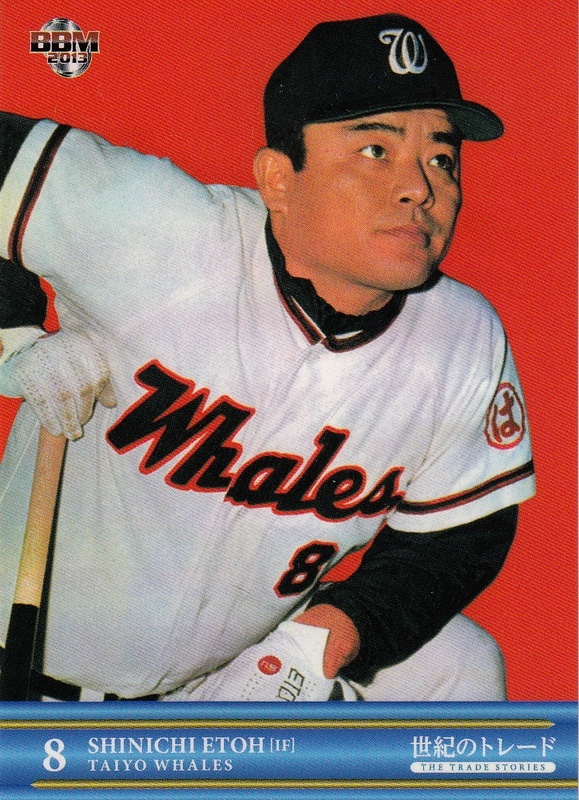 The earliest trade is the Koyama-Yamauchi trade from 1963-64, but the next trade included happened in the 1971-72 offseason. Some of the pictures used were in black and white. BBM announced this year's 2nd Version set today on their website. Like this year's 1st Version set, it looks like it's structured pretty much the way it has been the last few years. There will be a 36 card (3 per team) "1st Version Update" subset, 216 "regular" player cards (18 per team), 12 team checklist cards and a currently unknown number of "1st Pitch Ceremony" cards. The theme of the team checklists appears to be a highlight from the first part of the season (just like last year). 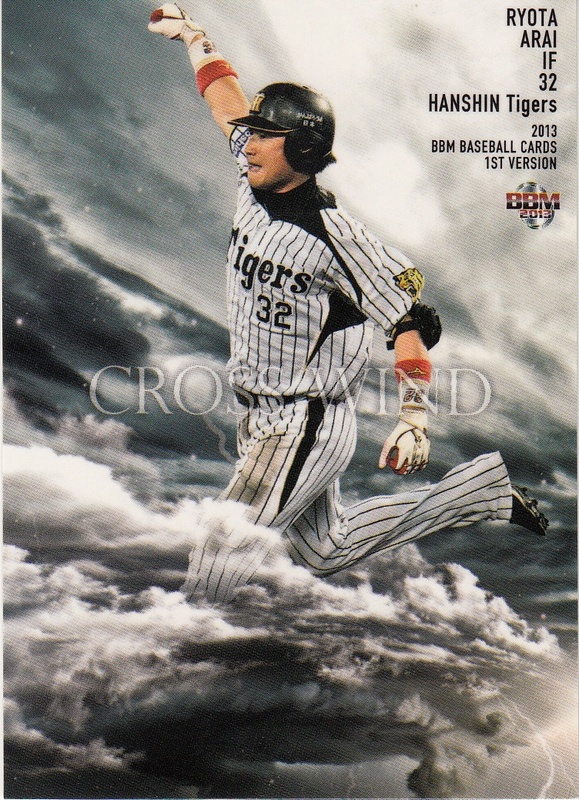 The set also includes the second installment of the "Cross Wind" cross set subset - 36 cards (3 per team). 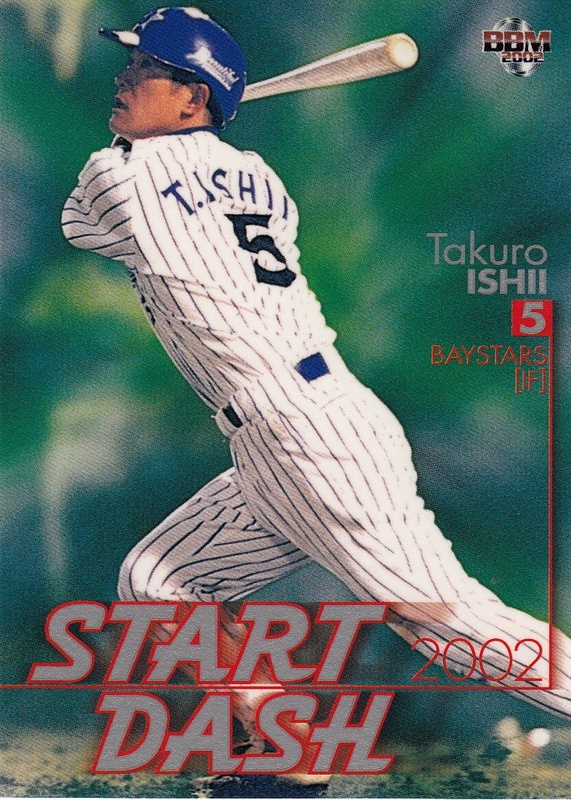 There will also be a number of parallel issues, two insert sets ("Strongest" and "Twin Gem" - 12 in each with "TWIN GEM" featuring two players - I assume one card per team) , patch cards and what looks like rookie autograph cards. The set will be released in early August. 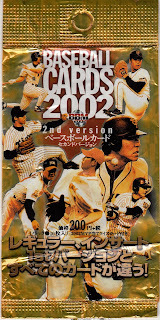 A couple of months after BBM issued the 2002 1st Version set, they followed it up with the 2nd Version set. 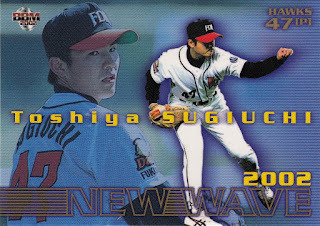 At 428 cards, it's only 11 cards smaller than the 1st Version set. Both sets have the same number of cards per team (30 players plus team checklist and manager) but the player selection is different between the two sets. It's hard to decide if there are any notable rookies in the set - most of the notable rookies from 1st Version also appear in 2nd Version. But does the 2nd Version card count as a rookie card? 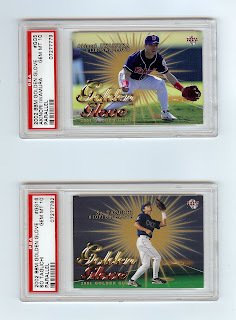 BBM had decided to split their two "traditional" insert sets - Best 9 and Golden Glove - between the two Versions. Best 9 was issued with 1st Version which left Golden Glove for 2nd Version. 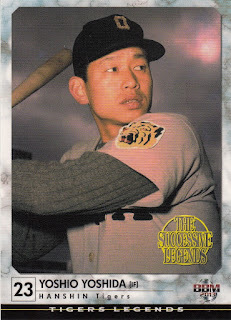 The cards would use the "lenticular" 3D process like the Prime Time Player insert set in 1st Version had. BBM also included a 24 card insert set called Opening Game. This set would feature the Opening Day starting pitcher and cleanup hitter for each of the 12 teams. 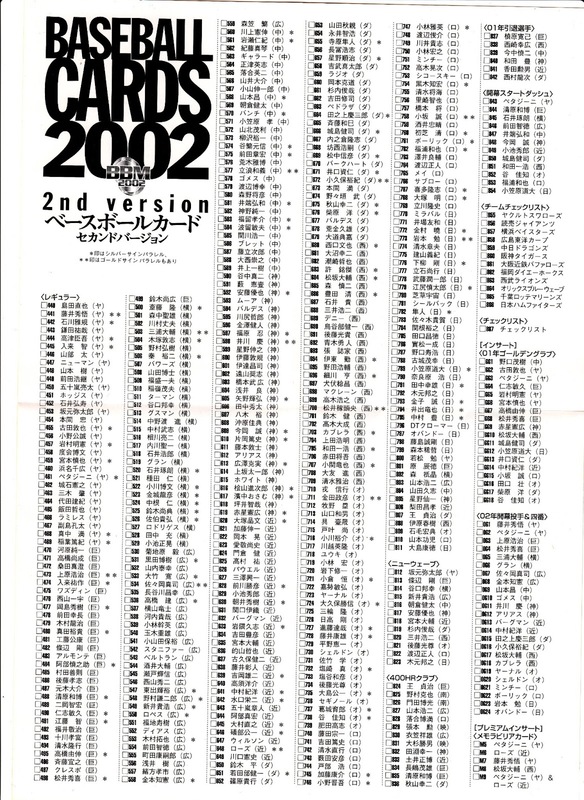 There was a parallel version of the Opening Game insert set also. Each card was apparently numbered to 1000. For the first time since 1999, BBM included a 12 card subset featuring each team's "top prospect". Instead of "Hot Prospect" or "Future Star", this year's subset was called "New Wave". The twelve players honored were Yuya Andoh, Takahiro Arai, Kenta Asakura, Mitsutaka Gotoh, Tsuyoshi Johbe, Kuniyuki Kimoto, Koji Mitsui, Daisuke Miyamoto, Yataro Sakamoto, Toshiya Sugiuchi, Kuniyuki Taniguchi and Masato Watanabe. 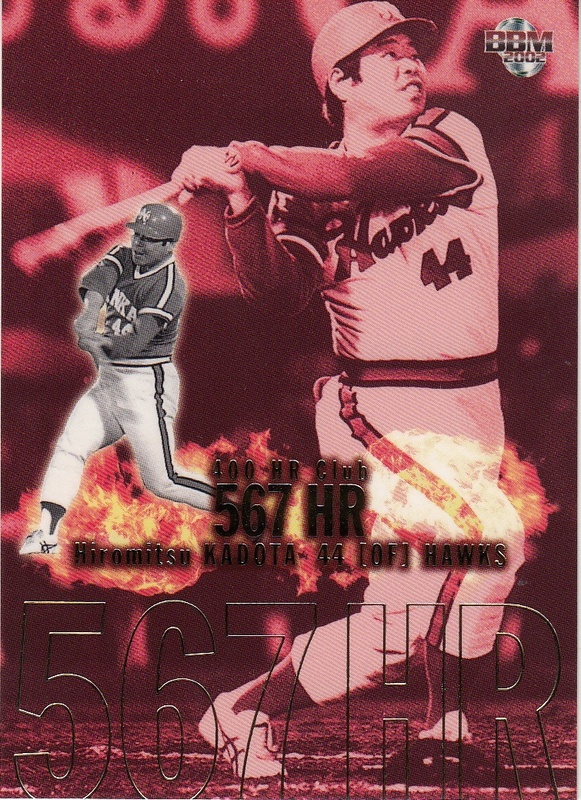 BBM also included a subset containing all the members of the 400 Home Run club - which was 13 at the time. The players featured were (from most home runs to least in the subset) Sadaharu Oh, Katsuya Nomura, Hiromitsu Kadota, Koji Yamamoto, Hiromitsu Ochiai, Isao Harimoto, Sachio Kinugasa, Katsuo Ohsugi, Koichi Tabuchi, Masahiro Doi, Shigeo Nagashima, Kazuhiro Kiyohara and Koji Akiyama. 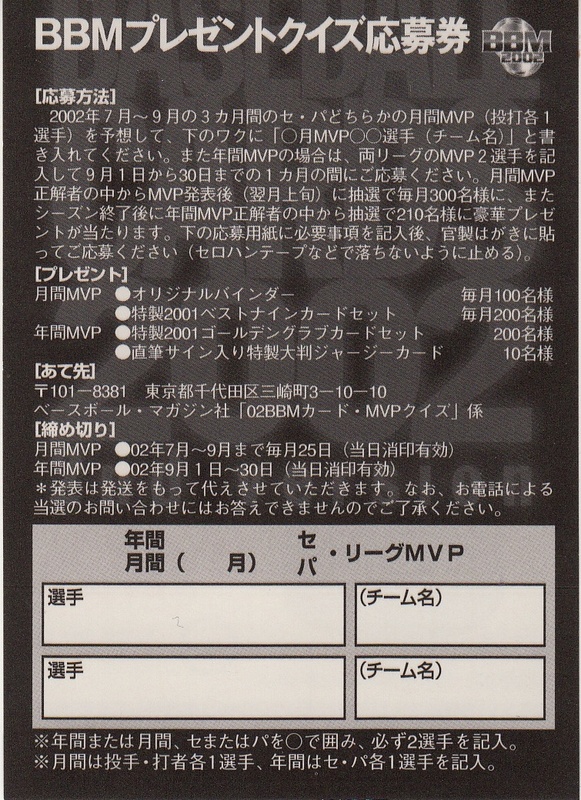 2002 was the first time that BBM included a subset for players who retired the previous season, a subset that would be a staple of either the 1st or 2nd Version (or both) until 2011. There were only six retirees included in this set - Shinji Imanaka, Isao Kohda, Hiromi Makihara, Tatsuji Nishimura, Yukihiro Nishizaki and Yutaka Wada. It's not entirely clear to me how BBM decided who was included in this subset - just off the top of my head I'm kind of surprised not to see Masaki Saitoh, who had retired after the 2001 season following an 18 year career with the Giants. The last subset in the set is called Start Dash and I'm not really sure what it's point is. 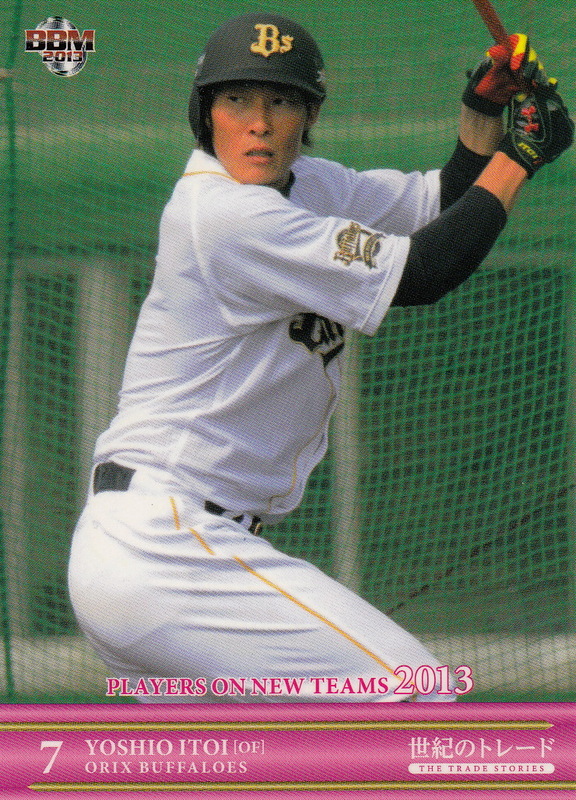 There are 12 cards (one for each team of course) and all but one of them are batters. I don't know if these are all players BBM felt got off to good starts in 2002 or what. 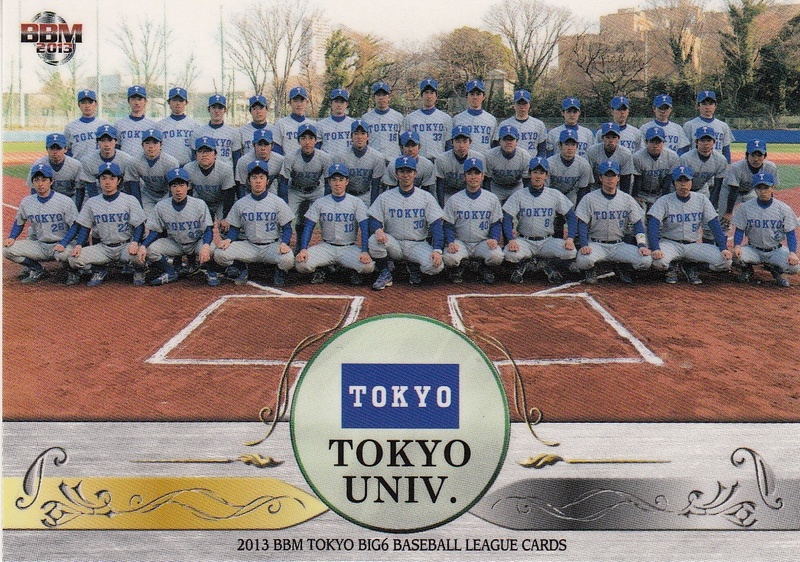 The twelve players are Kazuya Fukuura, Hirokazu Ibata, Makoto Imaoka, Takuro Ishii, Kenji Johjima, Kazuhiro Kiyohara, Hideo Koike, Tomonori Maeda, Michihrio Ogasawara, Roberto Petagine, Yoshitomo Tani, and Kazuhiro Wada. 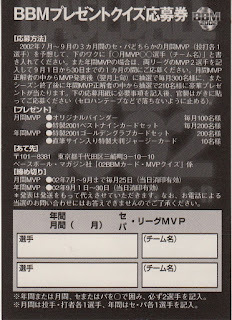 As was the case in the 1st Version, BBM included two separate facsimile signature parallel issues for the player cards. 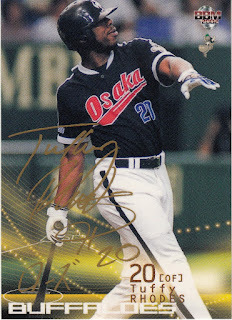 There are 120 "silver signature" cards (10 per team) and 12 "gold signature" cards (1 per team). 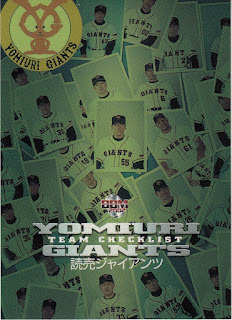 Frequently through out the late 90's and into the aughts, BBM would include a small poster and checklist in the box, presumably for a card shop to display on their wall, door or window. Like an idiot, it didn't occur to me to look to see if my scanner was big enough to scan the poster until this evening. I'll have to go back and add the posters that I have for the previous sets. 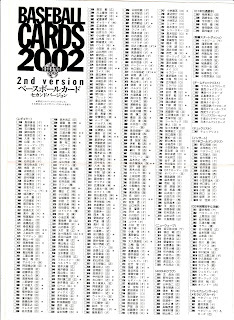 For the 2002 2nd Version set, the checklist was actually on the back of the poster. 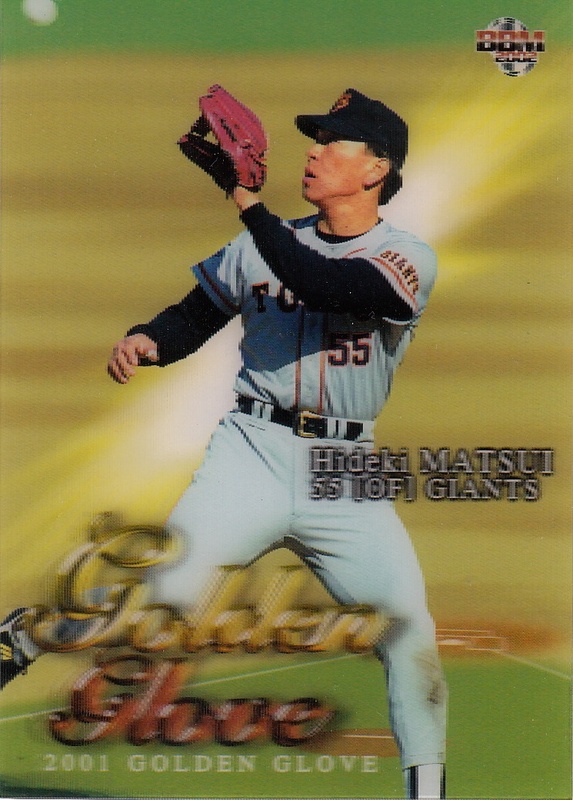 UPDATE: Scott Kaneko sent me an email letting me know that there was a promo/lottery version of the Golden Glove inserts that did not use the "lenticular" process. 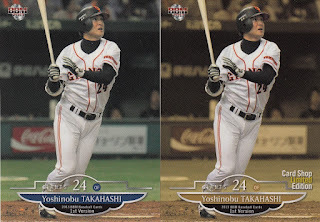 This matches both the 2002 1st Version Prime Time Player and the 2001 Best 9 inserts - both of those also had some sort of non-lenticular parallel that was available via some sort of mail in offer. Scott was kind enough to scan a few of these in so that I could add them to this post.